Last May’s ruling by Indonesia’s Constitutional Court (MK35/2012) resulted in hutan adat (customary forests) no longer being categorised as hutan negara (state forests). Instead they become hutan hak (forests subject to rights) the second of two categories of forest listed in Article 6 of the 1999 Forestry Law. This means hutan adat, while still subject to the jurisdiction of the Ministry of Forests are now considered to be areas where the communities may have stronger rights to lands and to manage resources – reversing a situation which has persisted for decades and which has seen the systematic abuse of indigenous peoples’ right to own and manage their forests, throughout Indonesia. Kawasan Hutan (Forest Zone), it isn’t surprising that the Forestry Ministry has been reluctant to hand back the forests to indigenous peoples. ignoring another important change in the law, which results from a separate ruling by Indonesia’s Constitutional Court (45/2011) and which undermines the Forestry Ministry’s claim over the majority of the Forest Zone. - Forestry Ministry Circular (Surat Edaran) SE1/Menhut II/2013, 16th July 2013. This Circular was addressed to all provincial governors, and district/municipal heads, plus heads of region level forestry services, informing them about the MK35/2012 changes, and asserting Forestry Ministry control over decisions affecting indigenous peoples’ customary forests. Referring to amended article 5 (3) of the 1999 Forestry Law, the Circular asserts that it is the Forestry Minister who determines customary forest status; and determining the status of customary forests requires the legal recognition of the existence of the indigenous people through a regional regulation (Perda). The Circular also reiterates the Constitutional Court’s consideration that if an indigenous people is no longer in existence, then the forest management right will revert to the Government, and the customary forest status changes to state forest. Forestry Minister Zulkifli Hasan who is interviewed in this film by Jakarta-based civil society organisation HuMa, says there is “no problem with MK35” as long as the customary forests are proposed and legalised by regional regulations (Perda). It should be clear who the community members are, he says and, once the Perda is passed, “we can take these lands out of the forest zone.” However, then he adds that it will be a long, difficult and costly process and mentions that using the “village forest” system (hutan desa) will be much easier. Hutan desa, he explains, still belong to the state, but can be managed by indigenous peoples. - Forestry Ministry regulation 62/2013 (Nov 2013). This regulation is the Ministry’s initial legal response to MK35/2012 and has drawn fierce criticism and opposition from civil society, including indigenous peoples. Regulation 62/2013 sets out changes to a previous regulation (No.44/2012) on the Establishment of the Forest Zone (Pengukuhan Kawasan Hutan), which sets out the rules for, and stages involved in, gazetting (legally determining) the Forest Zone. The regulation was analysed by Bernadinus Steni (HuMa) and Yance Arizona (Epsitema Institute) in a December 2013 paper. In January 2014, AMAN issued a press release and statement calling for the regulation’s withdrawal. Steni and Arizona point out that Regulation 62/2013 ignores another decision of the Constitutional Court (MK 45/PUU-IX/2011) which negates the Forestry Ministry’s claim over most of what has been “denoted” as the Forest Zone. This is relevant because the regulation states that written and non-written proof of rights over the land should predate the denoting of the Forest Zone (carried out around 1982). Non-written proof, which applies in most cases of indigenous peoples’ claims, consists of “dwellings, and public and social facilities, based on their historical existence.” Where these non-written proofs existed after the denoting of the Forest Zone, additional criteria apply: they must have been determined in a regional regulation (Perda); and noted in Village or Subdistrict statistics; and consist of more than 10 households living in at least 10 houses. This sets up many more hoops for indigenous peoples to jump through to reclaim their forests. The requirements presents serious difficulties for indigenous communities still occupying their customary territories, let alone for communities who have been evicted from their forests, whose villages have been destroyed, or for disparate communities who live in groups of ten or less families. Steni and Arizona’s analysis also highlights the confusion by the Ministry of Forestry between the terms “Forest Zone” and “state forests”. MK35/2012 takes customary forests out of state forests, not out of the Forest Zone, argue Steni and Arizona, but Regulation 62 states that customary forests are to be taken out of the Forest Zone (this also fits with the view expressed by Minister Zulkifli in the HuMa film). It is a further indication that the Forestry Ministry wants to stick to the old practice of treating the whole Forest Zone as under the control of the state, instead of allowing space for two categories of forests (hutan hak as well as hutan negara). At the end of their analysis Steni and Arizona ask a more basic question: is it really necessary to set up such a complex procedure in order to recognise the rights of communities who have so long been marginalised? What about the government’s role, mandated by the constitution, to give especial protection for marginal groups? Why is the Forestry Ministry making it so difficult for indigenous peoples? What hope is there for communities who have already lost their lands? AMAN’s analysis of Regulation 62/2013 further highlights its deficiencies. In a statement calling for the withdrawal of the regulation, AMAN accuses an “arrogant” government of blatantly twisting MK35/2012. AMAN calls on President SBY to take action to implement MK35/2012, to take the necessary steps to prevent violence against indigenous peoples demanding the rights to their territories, including customary forests, and to withdraw Regulation 62/2013. AMAN also wants the Forestry Ministry and other state agencies to issue guidance for implementing MK35/2012, and is calling on regional governments to immediately prepare regional regulations (Perda) to recognise and protect indigenous peoples. 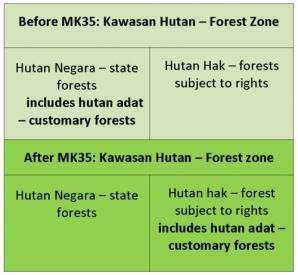 This “macro plan” for forests covering two decades (2013-2032) is controversial in the post-MK35/2012 period, because, once again, it appears to be based on state control of all the Forest Zone, thus ignoring the “forests subject to rights” (hutan hak) component of the Forest Zone. A series of maps attached to the Plan includes one map indicating the location of indigenous peoples in the Forest Zone. (Somewhat bizarrely indigenous locations are marked with mini Indonesian flags.) This has caused consternation as it indicates an apparently random scattering of very few areas of customary forests, without indicating numbers of people involved, boundaries of forests areas, or where the information has come from. - Highly controversial too is Law No. 18 of August 2013 on the Prevention and Eradication of Forest Degradation (UUP3H). Indonesian CSOs have objected to this law not least because it ignores MK35/2012 and can be used to criminalise indigenous peoples. AMAN has reported that the law has already been used to forcibly evict 380 members of the Semende Banding Agung indigenous community in Bengkulu province, Sumatra, from an area designated a National Park. AMAN has provided a useful overview of legal issues concerning indigenous peoples in 2013, including post-MK35 developments. It also summarises progress on mapping indigenous territories and provides information about conflicts involving indigenous peoples. The review includes an update on the Draft Law on the Recognition and Protection of Indigenous peoples, which AMAN wants to see passed during SBY’s last months as President and before the parliamentary elections this year. A new Law on Villages (Law No.6/2014) provides additional scope for the recognition of indigenous peoples and their rights to manage their own affairs at village level. It provides both opportunities and challenges for indigenous peoples, according to AMAN. The Court decision is dated according to the year the case was submitted (2012), not when the decision was issued (2013). Analisa Hukum atas Permenhut No 62 Tahun 2013, Dec 18,2013, Bernadinus Steni & Yance Arizona. See http://www.mahkamahkonstitusi.go.id/putusan/putusan_sidang_45%20PUU%202011-TELAH%20BACA.pdf. This is a significant change because it means that the forest zone can only be legally established once all four stages have been carried out (denoting the area, setting the boundaries, mapping and gazetting), rather than just once the first stage has been carried out, as previously. The difference between the area that has been denoted and the area that has been fully gazetted is huge: according to official data, just 21.07 million hectares, or 16.3% of what the Forestry Ministry has denoted as forests (in total 130.68 million hectares) has been fully gazetted. MK45/2011 results from an appeal by provincial and district level authorities seeking greater power over land allocation decisions. With such areas are defined as being outside the forest zone, there is a big risk – if not immediately then in the medium term - that these areas could be handed out to agribusiness investors, leading to a massive acceleration of forest loss and takeover of forest peoples’ lands. (See also DTE 95, March 2013 at http://www.downtoearth-indonesia.org/story/indonesian-csos-call-save-indonesia-s-remaining-forests). However, ignoring MK45, as the Ministry appears to be doing with Regulation 62/2013, can also be seen as damaging for indigenous peoples’ rights in that it allows the Forestry Ministry to retain its control over the Forest Zone while setting up obstacles for the recognition indigenous peoples. See 2013 in Review Indigenous Peoples’ Alliance of the Archipelago, as above..
 RRI Quarterly News, Oct-Dec 2013.